Our home is Very Clean and Well Maintained. Bright and Open....We include all Towels and Linens. Fully Equipped Kitchen. Plenty of parking on 2 levels along with street parking. Lake Level: Large Open Kitchen to Family Room/Pool Table. Dining Area and Island with additional seating. Washer and Dryer, Full Remodeled Bathroom with Shower. This level also has 2 Lazy Boy Recliners and TV. Middle Level: Master bedroom has King size bed, Family Room with 2 Queen size sleeper sofa's, 2 Lazy Boy Recliners, and additional Dining Area. There are 2 sets of sliding doors out to a deck that overlooks the water. Full Remodeled Bathroom with Tub/Shower. We also have 2 cots if needed for additional sleeping space. There is plenty of room to bring your Air Mattress and Sleeping bags. This house was perfect for our weekend! Plenty of bed space and plenty more room for air mattresses if you need them! The owners were very accommodating and responsive. The location is convenient by land OR lake. The girls called a water taxi on Saturday and they picked them up right from the dock at the house. Nice quiet cove for hanging out in the water or on the upper deck of the dock. 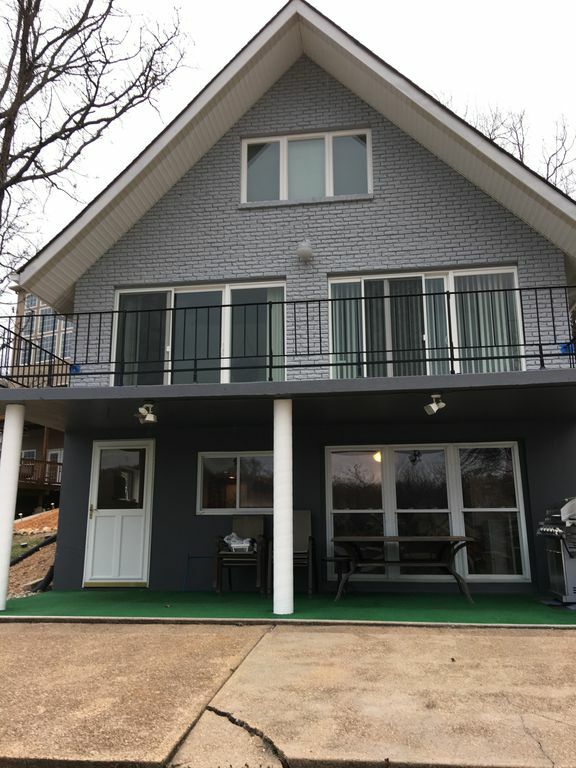 Yes, the driveway is steep, but that is pretty much any house at Lake of the Ozarks that sits down on the water like that. You'll appreciate it when you only have a few short steps to the water!! If you really have a problem with the driveway, there is room to park on the side of the road as well. At one point we had eight different cars at the house, one parked at the bottom, four parked in the lot at the front door and three on the side of the road and it was fine!! I would definitely book this house again in a heartbeat!! Very comfortable with everything we needed for our family get away. Freshly painted house and dock. Plenty of room to hang out inside and out. Everyone loved swimming off the dock and the younger ones were thrilled to jump from the dock sun deck.. Plus it's located close to activities like golf, go carts and great places to eat. Mark J.Where do you live? loved the house it was perfect for us. You are right on the water and the dock was perfect as well being in a no wake cove. Owner response is great as I had a very small problem when I booked with VRBO. It was my fault and I was able to contact the owner himself. I recommend this house to anyone. if you do not have fun here it is your own fault. We had a great time together! Overall the house accommodated 8 of us well. The dock/boat slip was fantastic. Things to be mindful of was the incredibly steep driveway that lead down to the boat ramp (use at your own risk). We used the nearby marina to launch. The beds were not comfortable but we had plenty of bedding. There's no ventilation in bathrooms or kitchen which resulted in moister and unpleasant smells (i.e. used cooking grease from the last tenants). The kitchen was stocked well but we had to clean most things before using them first time. The wifi could only be used while on upper floors or upper parking area. With a few minor adjustments this place was cozy and fun for both families. Dock was great. There was no paddleboat or boat lift as advertised. Pool table is in bad shape. Entire house needs updated. Carpets are gross and mattresses in all bedrooms are very firm. Overall feel of house was old and grimy. Fairly certain the cleaning crew did not show up before our stay as there were dirty towels on the floor and dirty sheets piled on beds. Great location, but not worth the rate charged per night. This house was a lot of fun! Very clean and inviting. The property managers were very easy to work with. The upper deck on the dock provided for more entertainment than we anticipated. And there was a table on the dock to play card games on. We had a group of 15 adults. Each floor has its own window AC, there's no central air so some of the bedrooms got warm at night but not terrible. The place had tons of pots and pans towels and tp and space to spread out. The drive way is intense. Park up top unless you havd a truck. It is very steep and we had a car almost high center on it. Would rent here again. We have a special for weekday's in May and June. Also, we are offering the last week of June at a special rate of $1,500. Please give us call!